So, previously I talked about what I want to see in a new D&D, which I’m calling D&D After Next. One of my primary goals for After Next is to speed up play; I want to be able to run a full mid-size adventure in a single 2-3 hour session. D&D will never be a party game, but I want it to be something you can convince your friends to try once and actually show off how an adventure goes, complete with an ending. I don’t want D&D to necessarily be an entire evening’s project. I want gamers to play an adventure in D&D, but then still have time to play an hour or two of Smash or Halo or some other game. The TTRPG demographic tends to be a bit older; we have a lot going on. School, work, friends, family, watching hours upon hours of syndicated television on Netflix, getting on the internet and complaining about games, etc., etc. Anyways, enough of the why, let’s talk about the how. How do you make D&D a 2-hour affair? The answer is simple; combat. Combat in D&D came from table-top wargames, and was born in era when hobby games didn’t have much competition. So combat in D&D looks and feels like a wargame, complete with complex turns, measurements that need to be accounted for, and a long list of specific effects which must be learned independently. While much of the industry has moved away from this, the poster boy for the entire genre, Dungeons & Dragons, languishes in the past because it is convinced that it just needs to recapture some elusive, mystical quality from its glory days by going back to those mechanics. I disagree; the real secret to D&D’s early success, besides the absolute lack of competition, was Gary Gygax’s salesmanship. 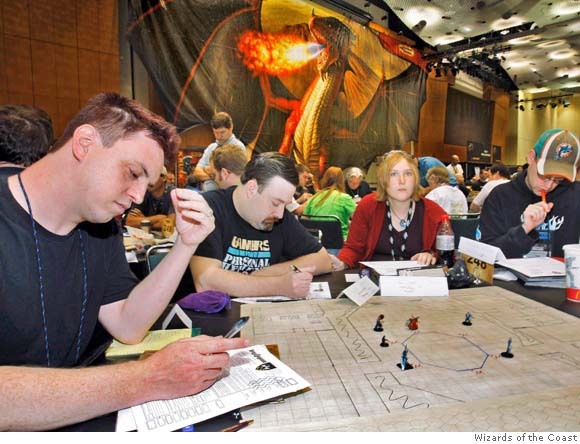 I will save more on that for another article about marketing your game, but for now here’s my brilliant theory; what makes D&D familiar is not what makes it fun. D&D needs to be willing to re-examine some of its fundamental assumptions and discard ones that don’t help it get where it wants to be. One of those old assumptions is the complex combat, which focused on tactical decisions to the point that it takes a very long time to kill 5 kobolds. Turn structure; between movement and combat maneuvers and spells and free actions, swift and/or immediate actions, standard actions, full-round actions, you are going through 5-6 lists of stuff you can do and choosing one from each list to make the optimal combination. Keeping track of all these actions and phases is not difficult, but it does take time. Die rolls; A bog standard attack takes at least two rolls – to-hit and damage – and a crit takes many more than that. That’s not counting Opportunity Attacks, or multiple attacks on a turn, or grappling. These have largely remained untouched for decades of D&D’s history, and I don’t think that’s healthy. After Next’s combat system will not be grid-based, initiative order will not be so quickly forgotten, it will have a simplified turn structure, and it will reduce the number of dice you have to roll. Let’s take these each separately. The grid was a perfectly fine way to make D&D for wargamers who had the stuff to make grids handy. That is a much smaller portion of the D&D-playing populace now, though, so we need a new way of seeing the combat. Many modern RPGs have highly abstract location systems, where there is literally no objective way to tell how far one thing is from another; it’s entirely based on how the player/GM is imagining it. When those two disagree, though, confusion and sometimes conflict ensues. So, we need an objective way of seeing everything; Areas. Areas just mean that the environment is chopped up into different regions or zones or whatever you want to call them, and that is the finest level of positioning detail we care about. Not all areas will be the same size; an area may be as small as a narrow staircase or as large as a spacious field, and that’s OK. The borders of an area will be based on the features of the map; walls, hallways, possibly furnishings or other stones, anything that breaks up an even surface. A character in any given Area will be able to melee against any target in that Area, no matter how many people he might walk by in doing so. The idea is that the characters in an Area are not at fixed, stationary positions, but rather are moving around in reaction to the other combatants, so you can attack who you like. Now, you still need the idea of a front-line and a back-line, so let characters in melee form up and essentially hold the aggro of a number of foes. As long as there aren’t more melee enemies on the Area than that formation can hold, the enemies can’t attack the ones the formation are protecting. For instance, if a Wizard, Paladin, Barbarian, and Ranger are in one party, and they’re fighting a bunch of goblins, then the Paladin and Barbarian could form a line, protecting the Wizard and Ranger, and prevent goblin attackers from being able to attack the latter two. For now I will tentatively set the limit that N number of melee characters in a formation can prevent 2N-1 enemy attackers from targeting the back line. In layman’s terms, the front-line can hold off anything less than twice their own number, but more than that can get past them. So a 1-man line can hold off 1 opponent, a 2-man line can hold off 3, a 3-man line can hold off 5, etc. Of course there would be feats or abilities which increase this. That’s enough for formations now, but I have more ideas for them later. Rolling up new Initiative every fight is really just a time-waster. It randomizes the slight tactical advantage that going first brings with it, but I don’t think it’s worth the time we waste rolling it, figuring out the order, and then forgetting it and figuring it out again multiple times per fight. 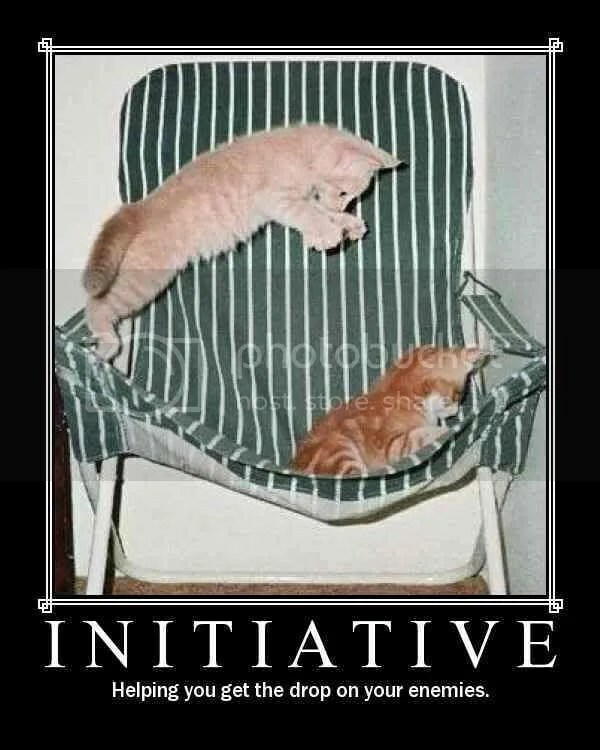 So, to keep it simple, we could just make Initiative a static number. Then suggest that the players would sit in order of initiative, so we can just go around the table. That’s an option, in case you really want to speed up play. Your total initiative bonus is now just your initiative, so if Bob goes before Sally and after Paul in one fight, the order is still Paul, Bob, Sally in the next fight. As for turn structure, we’ll lay the ground rule that a round is not 6 seconds of combat, it’s a single narrative beat, which might be 2-3 seconds or 30 seconds or more. During this round you typically get 1 significant action. Whether that’s an attack, a spell, or breaking down a door or climbing up a rope or moving into a new Area, you can do one thing this turn. Now, there’ll probably be several ways to cheat on this rule, and that’s fine; if you Charge you can move into a new Area and attack, for example. Anything less than that – switching weapons, moving around in your Area, grabbing an item (if uncontested), talking, etc., are simply free actions. On your turn, you first resolve any on-going effects, like taking poison or environmental damage, rolling to resist a charm or other debuff, etc., then take your action, attacking or moving or whatever it may be. This way there is only one phase of the turn where you have to remember what conditions are affecting you, and the exciting part of your turn, the action, is also the climax. All the above is nice, but it still falls short of really bringing a typical combat down to the 15-minute benchmark. When I’m late for something and I need to cut down on transit time, I try to speed, even though I know that the # of lights is a far greater indicator of how long it takes to arrive. If I really want to cut out chunks of my travel time, I need to cut out the number of lights on my route. Similarly, in After Next, to really cut down combat time, we need to cut out die rolls. The easiest thing is to do away with separate to-hit and damage rolls. I don’t think damage rolls contribute that much in the first place; yes, it’s kind of exciting to roll max damage, but it’s also really frustrating to only get a 1 or a 2 on your d8 or d12. So, I think moving to fixed damage values for weapons, +STR mod, works just fine. Now this isn’t the whole story, as I plan to implement degrees of success; beat the enemy’s AC by enough and you deal more damage, so there is still some variance to how much damage you deal, but it only requires one roll. Another problem is critical hits. I have a critical hit system that changes some fundamental aspects of the game, taking a hint or two from The One Ring, the latest Lord of the Rings RPG, which I’ll explain in the next article in this series, but suffice it to say that crits won’t take 4-6 rolls (attack roll, crit confirm roll, damage roll, damage roll 2, damage roll 3, etc.) anymore. Those two things will cut down on resolution time, but there’s two more larger changes that will have far-reaching implications for the combat engine. First, allow what I call ‘Active Defense.’ When you are attacked by an opponent, you have the option to sacrifice your next turn to roll an attack against your assailant, opposing their own attack. These two attacks are rolled simultaneously and whoever wins deals damage and whatever else their hit does as normal, and play proceeds. This will go through 2 turns in 1, It changes the dynamics of the combat somewhat, but I think it’s a solid idea to build on. The second game-changer is the option to jointly attack a single target. If everyone is going to attack the big troll anyway, just have them roll it all simultaneously. There are a few strings attached, namely that you can only do this on the turn of the last participating character in initiative order. So if Paul, Sally, and Bob all want to attack the dragon, they can all do so, acting on Sally’s turn (the last in the initiative order established previously), and resolve their actions simultaneously. This way you can resolve three turns in the space of one (give or take). In addition, attacking with others will bring more added benefits. Has anyone ever played Chrono Cross? In that game, each character had special abilities that only they could perform, and when they were in the party with certain other characters, those special abilities were converted into Dual or Triple Techniques, for a big boost in power. After Next would give little incentives for attacking with other characters, since you have to use the lowest initiative score. These would be class-based, and you’ll be able to purchase different effects. For instance, a Fighter might be able to add his STR bonus to the damage of characters attacking with him, or a Warlord might give companions a bonus to the attack roll, a rogue might get an automatic sneak attack, a sorceror might change the damage others deal to fire damage or simply add fire damage on top, and a Cleric might bless or heal those who attack with him. Of course the lower level effects would be the weaker ones, and the higher level effects would be more powerful. This would accelerate combats, as you’re basically folding a lot of buffs and things into an attack action. It sounds pretty impressively powerful right now, and it would require a lot of number-crunching in order to find the right balance points for these things, but I think that these two things would actually help the party feel like it’s working together, give a more visceral, action-packed feel to combat, and most importantly, cut down the time it takes to kill a Minotaur or a Medusa in half. This entry was posted in After Next, D&D Next, Dungeons & Dragons, Game Design, Games, TTRPGs and tagged combat, D&D 5e, D&D Next, Dragons, Dungeons, game design, homebrew, initiative, RPG, turn structure by Stubbazubba. Bookmark the permalink. All very interesting ideas. I’m a 2nd edition gamer myself, so I don’t fully grasp all the concepts you are talking about here. From my own experience, I’ve devised systems where the damage and to hit roll were combined in one and it was an abyssmal failure. Perhaps you’ll have more luck, though. From the sounds of it, I think 2nd edition was simpler and slightly faster than later editions, so perhaps you might want to take a brief look at it. All the “improvements” in gaming systems comes with a cost. And that cost is usually time. Anyway, good luck. I am yet to try 2nd Edition out. I admit that that’s a little before my time. I know 2nd Edition has some mechanical baggage that I’m not a fan of, but it is something I should look at for ideas, since I know its combat was simpler than later editions’, and thus a bit quicker. Thanks for the heads up. Next article will go into the damage system more in depth, you’ll have to judge for yourself how well it does. Thanks for replying!